A few notes: This dish will be quicker if you start with cooked chicken. I cooked up a couple of extra chicken breasts when preparing a chicken dish earlier in the week, which worked well. You could also use rotissere chicken. Another important thing to keep in mind is that the sauce will look really gross when you are making it...salsa, spices, scallions, and chicken broth all mixed together just do not look very pretty. Don't worry...by the time you add the cheese, chicken, and pasta, everything will come together and be totally yummy! 1. Bring a large pot of salted water to a boil. Add the macaroni, and cook until al dente. Drain and set aside. 2. Meanwhile, make the sauce. Melt 1 T of the butter in a large, non-stick skillet over medium-high heat. Add the scallions, chili powder, 1 tsp salt, and a few grinds of pepper. Cook, stirring, 2 minutes. Add the salsa, and continue to cook for another 2-3 minutes, until the scallions are softened. 3. Reduce the heat to medium, and add the remaining 2 T butter. Stir to melt the butter, and the sprinkle in the flour. Cook, stirring, until a paste forms, about 1 minute. 4. Gradually whisk in the broth, followed by the milk. Work slowly to prevent lumps of flour from forming. I'm not going to lie - the mixture is going to look pretty gross at this point, but have faith -- it will be delicious in the end! 5. Once all the liquid is added, bring to a simmer and cook, stirring occasionally, until the mixture is thick enough to coat the back of a spoon, about 6 minutes. 6. Add the cheese, and whisk until just melted. 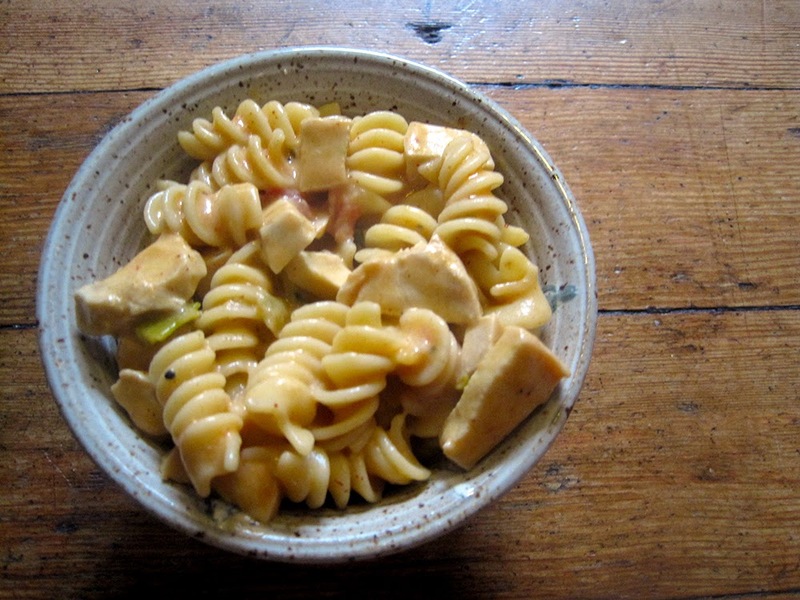 Then add the macaroni and the cooked chicken, and stir to combine well. Cook for another 3-5 minutes or so, stirring often, until everything is heated through. 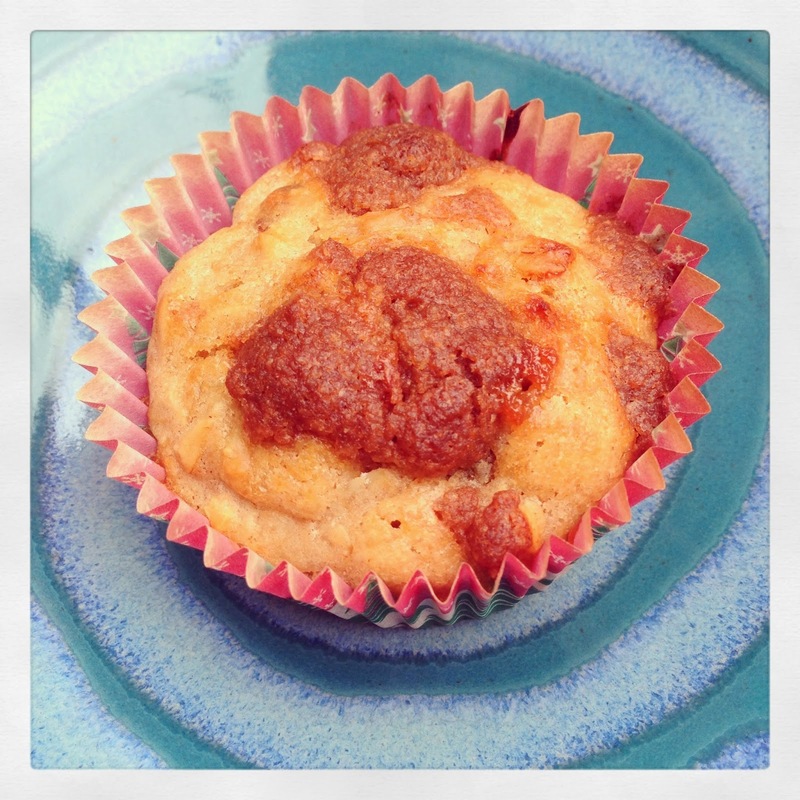 We picked up some dates at the farmer's market, and I used them in these tasty muffins. These muffins are kind of like portable oatmeal, stuffed full of rolled oats and dates, and with a cinnamon-brown sugar topping. Yum! The topping is what really makes these muffins special, so don't skip it. Even with the extra step, the muffins are really easy to put together, even in the morning when you might not have had coffee yet. I often find low-fat muffins don't keep too well, but these did, so you can make a batch and stash them in an air-tight container for breakfast all week. 2. Whisk together the flour, brown sugar, baking powder, salt, and cinnamon in a mixing bowl. Stir in the oats and dates. 3. In a large measuring cup, whisk together the milk, olive oil, and egg. Pour into the dry ingredients, and stir together until just combined. Divide among the muffin cups (10 for larger muffins, 12 for smaller mufins). 4. Mix together the topping ingredients in a small bowl until crumbly. Sprinkle evenly over the muffin batter. 5. Bake 15 minutes. Enjoy warm, or let cool and store in an airtight container for a few days. 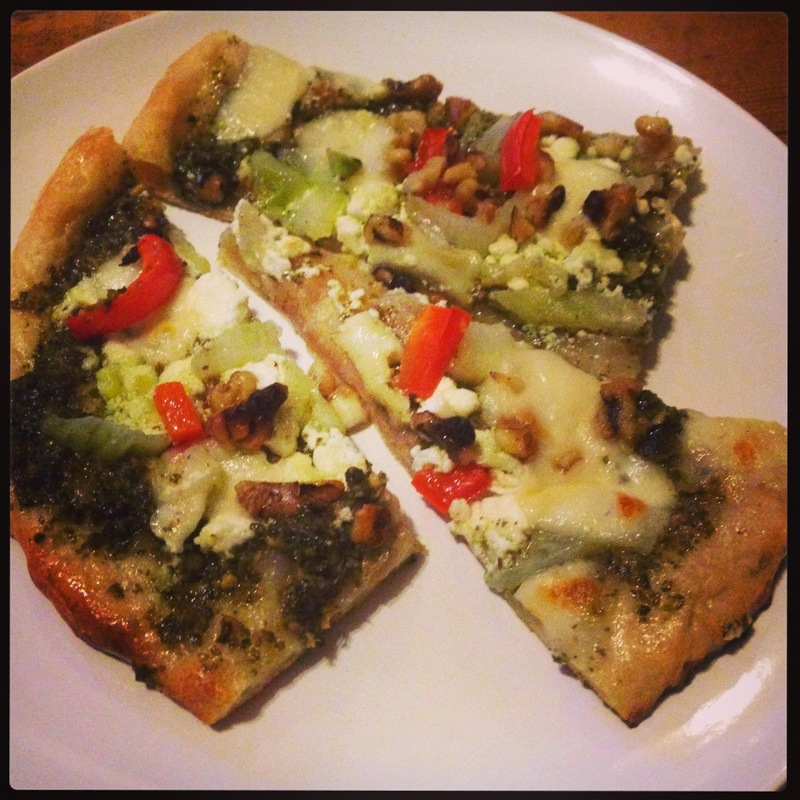 Pesto, fresh mozzarella, goat cheese, red peppers, and chopped walnuts. Yum! Another thing I've recently become obsessed with is homemade granola. My friend Nina made me some a few months ago, and I recently got her recipe and have been eating it pretty much constantly ever since. The recipe is infinitely customizable -- I have the first combo I made listed below, but you can mix and match the nuts and dried fruit as you like. Last time I made it with cashews, sunflower seeds, and dried cranberries. So good! I like my granola sprinkled over yogurt, with some fresh berries if I have any on hand...it is pretty much the perfect breakfast! The other nice thing about this recipe is that it is so easy -- mix everything together with your hands, spread it out on a cookie sheet, and bake. So easy you can actually make it in the morning, if you have a bit of extra time. This would also be a great recipe to make with kids since the measuring doesn't have to be exact and the mixing is a little messy. 1. Preheat the oven to 300 degrees. Line a baking sheet with foil, and spray with oil. 2. Combine the oats, pecans, cashews, honey, olive oil, sesame seeds, vanilla, and salt (i.e. everything except the fruit) in a bowl. Mix together with your hands until everything is evenly incorporated. Spread the mixture out in a thin, even layer on the baking sheet. 3. Bake 10-20 minutes, until the granola is as toasted as you like. Stir in the raisins while still warm. 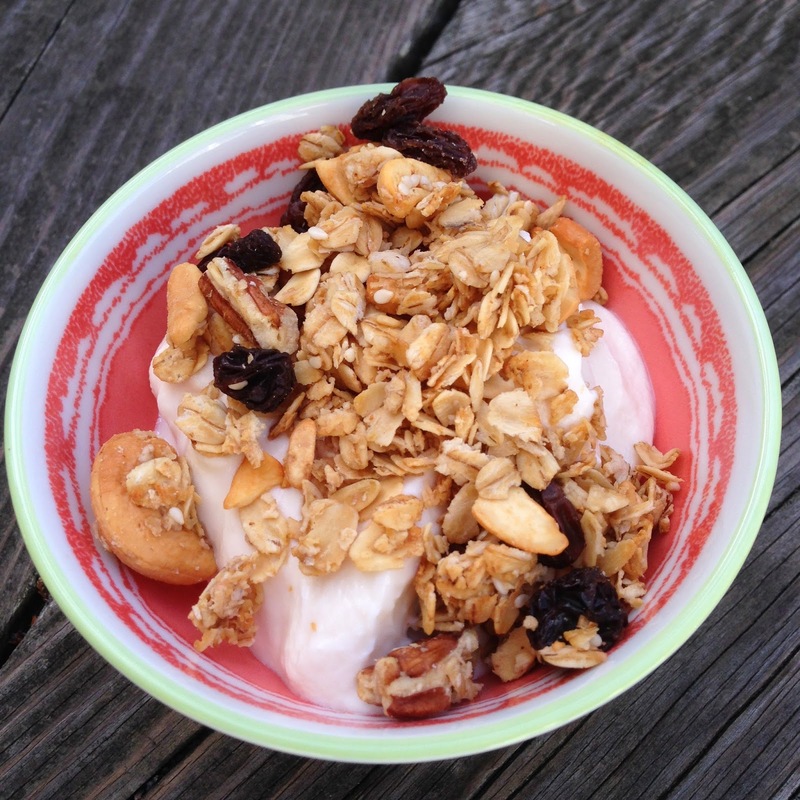 Let the granola cool completely, and then store in an airtight container for up to two weeks. Happy St. Patrick's Day! Although I don't have an Irish dish for you today, I do have a green one! This hearty salad is absolutely delicious. 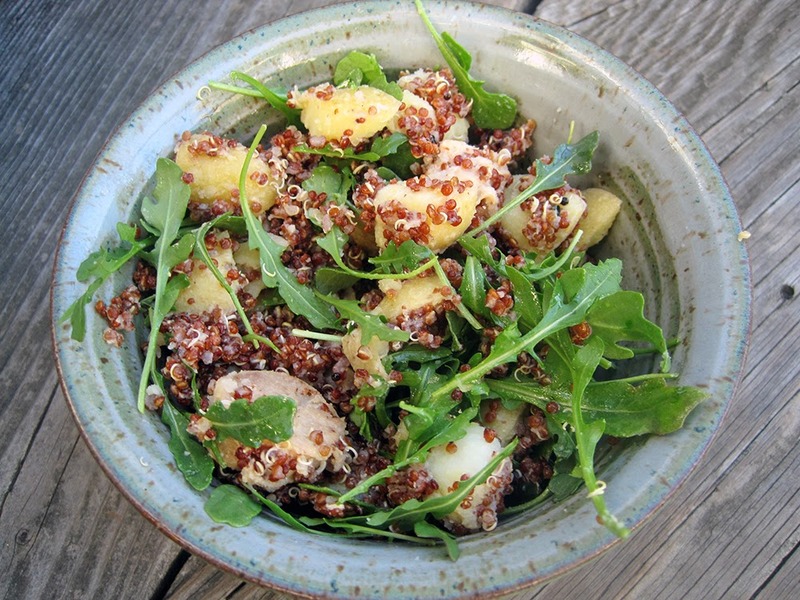 The potatoes, sausage, and quinoa all make this dish suitible for a main dish, and the arugula adds a peppery lightness. The mustard-y dressing pulls everything together perfectly - yum! As long as you store the arugula separately, the salad stores well in the fridge and is a great option to pack for lunch. 1. Cook the quinoa in boiling water, according to the package instructions. 2. Place the potatoes in a pot, cover with cold water, and sprinkle with salt. Bring to a boil, and then simmer until tender, about 5 minutes. Drain. 3. Meanwhile, saute the sausage over medium-low heat in a non-stick skillet, until crisp. Transfer the sausage to a paper towel-lined plate using a slotted spoon, and reserve the rendered fat in the pan. 4. Transfer the reserved fat from the sausage to a jar with a tight-fitting lid. Add the oil, mustard, tarragon, and 1/8 tsp salt. Screw on the lid, and shake well until combined. 5. Gently mix 1 T of the dressing into the potatoes while they are still warm. When the potatoes are cool, mix with the sausage and arugula, and then toss with the remaining dressing. 2. Stretch out your pizza dough and place it on your prepared pan. Generously brush the entire crust with olive oil (all the way to the edges). 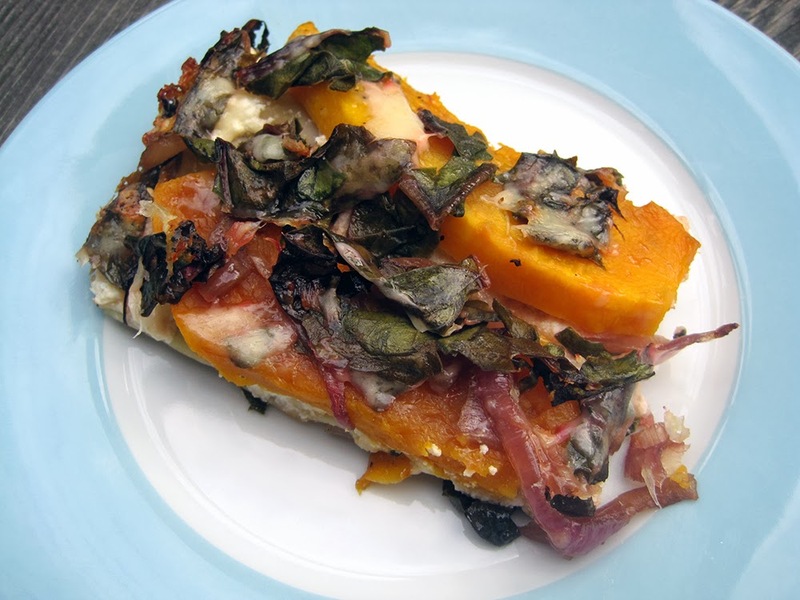 Sprinkle evenly with the blue cheese, and then arrange the squash and bell pepper in an even layer. 3. Bake the pizza for about 11 minutes, until the crust is almost done. Scatter the walnuts over the pizza, and cook for another 2-3 minutes. 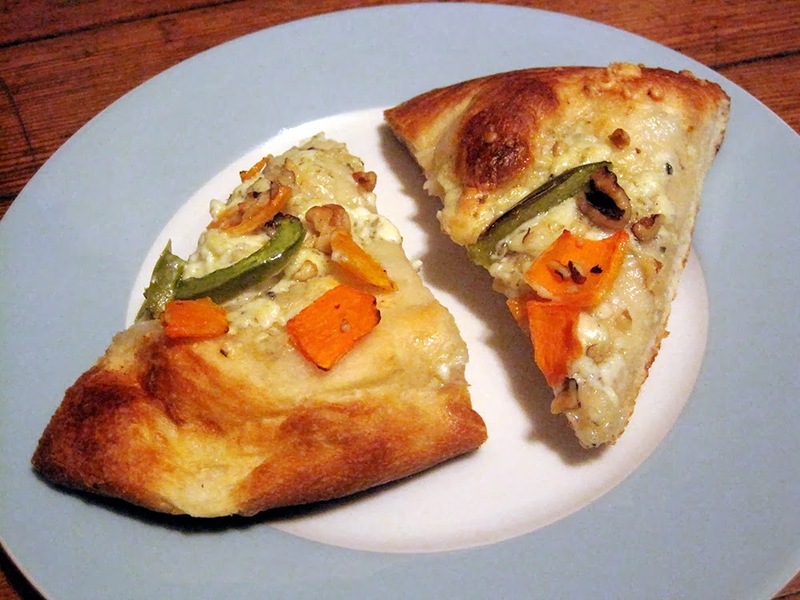 You want the crust to be nicely browned, the cheese to be melted, and the squash and peppers to be softened. 4. Let the pizza sit for a few minutes before slicing and serving. Yes, I am posting a recipe for something as basic as oatmeal! But, believe me -- this oatmeal recipe is something special. Rather than being simmered and stirred, the oats are toasted and steamed. The result is extra fluffy oatmeal without even a hit of that gluey, sticky texture that oatmeal can sometimes have. Even better, the formula for making it is extremely easy -- toast up any amount of oats you like, then add an equal amount of liquid (I've used various combinations of water and milk, all with great results), boil, cover, and steam off the heat for 8 minutes. That's it! Top with more milk and your favorite oatmeal toppings...I like brown sugar and cranberries, but you can get more creative than that. Bonus: clean-up is much easier -- no oatmeal glue on the bottom of your pot! 1. 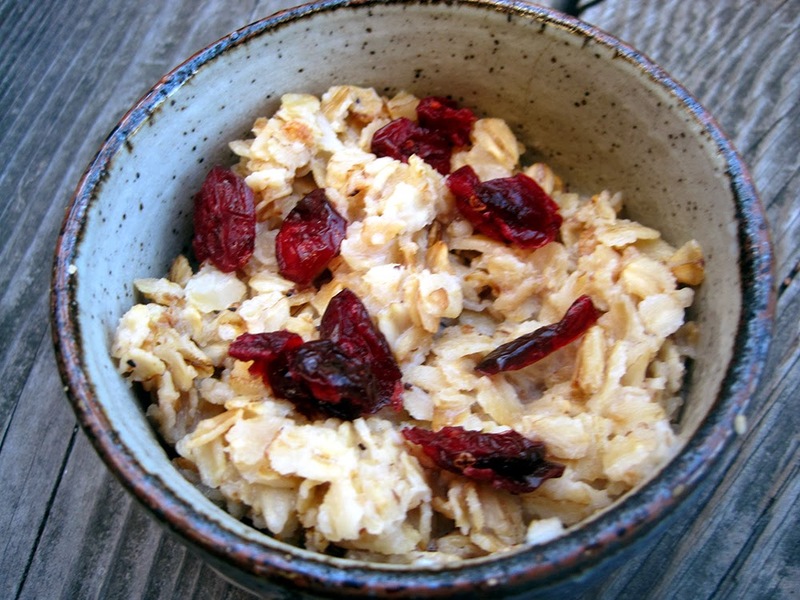 Use a pot that allows your oats to spread out in an even, relatively thin layer (no more than an inch thick). 2. Melt the butter in the pot over medium heat, and then add the oats and toast, stirring occasionlly, until they smell fragrant and nutty (5 minutes or so). 3. Pour the oats into your serving bowl, and let the pot cool off for a minute or two. The return it to medium heat and add the milk and water. Bring to a low boil. Add the oats, stir to combine, and then remove from the heat. Cover the pot, and let sit for 7 minutes -- no peeking! 4. Scrape the oatmeal back into your bowl, and serve with whatever toppings you like. My partner for this month's Secret Recipe Club was Melissa of A Fit and Spicy Life. I was immediately drawn to her recipe for bourbon-orange pork tenderloin. We love pork tenderloin for weeknight dinners because it cooks up quickly without a lot of attention. I usually make this recipe, altering the fruit to match the season. 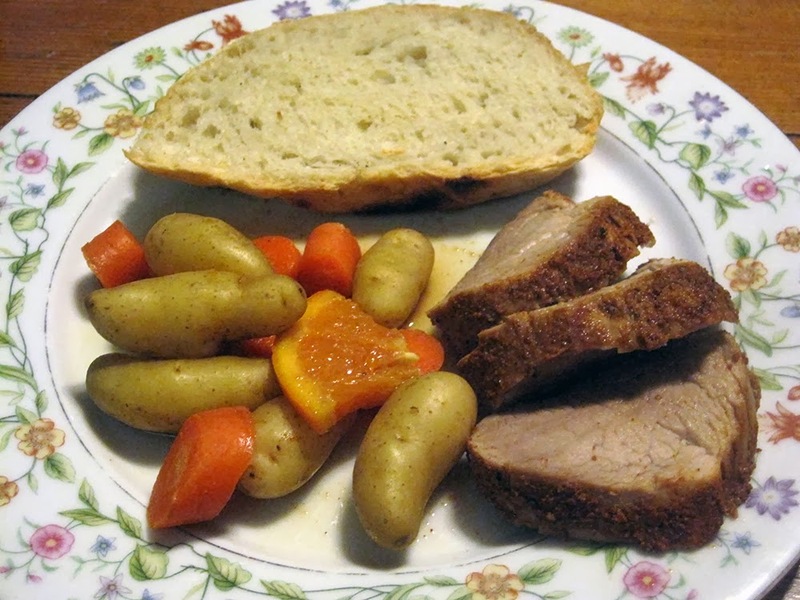 Melissa's recipe was a great way to get out of my pork tenderloin rut and try something new! The pork is roasted alongside potatoes and carrots, and flavored with smoky spices, bourbon, and orange juice. I loved roasting everything together in the same pan, and the flavors were delicious. The only thing I would change next time is to remove the cover halfway through cooking to help things crisp up a bit. Thank you to Melissa for a great new recipe! 1. Preheat the oven to 375 and spray a 9x13 baking dish with oil. 2. In a small bowl, stir together the cumin, paprika, salt, and pepper. Rub it all over the pork, and then place the pork in the baking dish. 3. Scatter the carrots and potatoes around the pork. Cut one of the oranges in half, and squeeze the juice all over the pork and veggies. 4. Slice the other orange into thick slices, and lay them on top of the carrots and potatoes. 5. Drizzle the bourbon over everything, and then season the vegetables with a bit of salt and pepper. 6. Cover with tin foil, and bake 35-45 minutes, until the pork is cooked through. Let stand 5-10 minutes before serving. Tim's parents got me Mollie Katzen's new cookbook for Christmas, and we've been enjoying the recipes from it ever since! As with her previous cookbooks, the focus is on vegetables, and the preparations are always unique and delicious. This vegetarian lasagna is no different -- it's got layers of bold, delicious flavors that all magically meld together with each bite. The greens are tender and mixed with slightly toothsome red onions that have been softened just enough to sweeten them up. The greens are layered with balsamic-drizzled winter squash -- I used banana squash, but any hard winter squash should work here. Alongside the veggies are pasta sheets and a creamy, garlicky mixture of ricotta and mozzarella. Total heaven! I guarantee you will not miss the meat. This does have quite a few steps, and although none of them is difficult, I recommend either saving this for a weekend or preparing some of the elements ahead of time. The squash layer and the greens layer can both be prepped ahead and stored in the fridge until ready to use, and then you just have to cook the noodles, stir together the cheeses, and layer everything together on the night you want to eat the lasagna. Leftovers kept well, so this is also a nice option to take for lunch. 1. Preheat the oven to 400 degrees, and line a large sheet pan with foil. 2. Prepare the squash. If working with chunks of banana squash, simply cut off the peel. For butternut squash, halve the squash, scoop out the seeds, and then cut off the peel. Then slice the squash into 1/2-inch thick slices. Grease the foil-lined pan with olive oil, and then arrange the squash in a single layer (use another pan if necessary). Season with salt and pepper. Roast the squash for 20-30 minutes, until the squash is tender and nicely browned. If the bottoms are getting browned too quickly, you can flip the squash part of the way through baking (I didn't find this necessary). Sprinkle the squash with 1 T of the balsamic vinegar, and set aside. Turn the oven down to 375 degrees. 3. Prepare the onions and chard. Place a large skillet over medium heat and add a good drizzle of olive oil. When the oil is hot, add the onions and a sprinkle of salt. Cook, stirring, until nicely softened, 5-6 minutes. Stir in the remaining 2 T balsamic vinegar, along with the chard and another sprinkle of salt. Cook, stirring for about a minute, until the chard is just starting to wilt. Remove from the heat. 4. Cook the noodles. Bring a large pot of water to a boil, and add a little olive oil. Add the lasagna noodles, stirring to keep them from sticking as much as possible. Cook for just 4 minutes -- they won't be cooked all the way through. Drain and rinse under cold water, separating any noodles that have stuck together. 5. Prepare the cheese layer. In a medium bowl, mix together the ricotta, mozzarella, garlic, and 2 T olive oil. Season with salt and pepper and mix again, making sure the ingredients are evenly distributed. 6. Build the lasagna. Spray a 9x13 baking dish with oil. Add a layer of noodles. Top with half of the cheese mixture, half the squash, and then half of the onion-chard mixture. Sprinkle with about 1/3 cup of the Parmesan cheese. Repeat the layers (noodles, cheese mixture, squash, onion-chard mixture, and Parmesan). 7. Bake uncovered in a 375 degree oven for about 10 minutes, and then cover with foil and bake for another 20-25 minutes, until the lasagna is heated through. Let sit for 5-10 minutes out of the oven before slicing and serving. Whew, sorry guys -- another long break in posts! This has been a crazy few months...getting engaged, looking for jobs, working on finishing up my dissertation...so much going on. I can now check one of those things off my list: we are officially moving to Boston in June! If you know the area and have any recommendations, please let me know in the comments. I am looking forward to lots of lobster rolls and clam chowder in my future. Now, on to a meal I made a while back and never managed to post. I have to admit: while I was making this meal, I did have a couple of moments of "Why did I decide to make something so complicated for dinner tonight?!" This isn't the most complicated thing I've ever cooked, but it does feel like it when you're hungry. :) But, once I tasted the food, I decided it was well worth all the effort, because this dish is amazing. Just save it for a weekend! The fish is cooked really simply, and then paried up with more complex sides. The slaw is creamy, crunchy, and peanutty in the best way possible. I sometimes find peanut butter-based dressings to be overwhelming, but this one is perfectly balanced. Word of warning: while some slaws keep beautifully, this one was definitely best the night it was made. I probably wouldn't try to keep leftovers for more than a day or two. Also adding crunch to the meal were millet pancakes. The millet is cooked first to soften it up a bit, but it still provides a nice little crunch when stirred into a batter with scallions and fried up in hot oil. The dipping sauce isn't strictly necessary -- in a pinch, you could just use soy sauce -- but it is really tasty and makes the meal feel extra special. 1. Cook the millet for the pancakes. Bring a large pot of water to a boil, and add the millet along with a few generous pinches of salt. Simmer until tender, 15-20 minutes. Drain off the water using a fine-mesh strainer, and then spread out the millet on a flat surface (such as a large rimmed baking sheet) to cool. 2. Make the slaw. Place the red onion in a small bowl, and cover with boiling water. Set aside. 3. Place the cabbage in a large salad bowl. Sprinkle with the sugar, vinegar, and salt, and toss to combine. 4. In a small bowl, whisk together the peanut butter, garlic, and 2-3 T boiling water (enough to make a smooth sauce). Pour over the cabbage and toss to combine. Drain the water off the onions and add to the cabbage, along with the grated carrot. Toss again to combine everything well, and stash in the fridge until ready to serve. 5. Make the dipping sauce. Whisk the dipping sauce ingredients together in a small bowl. 6. Preheat the oven to 425 degrees. Line a baking sheet with foil and set aside. 7. Make the pancake batter. In a medium bowl, whisk together the eggs, buttermilk, cornstarch, and toasted sesame oil. Add all of the millet along with about 3/4 of the scallions, and stir to combine. Set aside. 8. Stir the remaining 1/4 scallions into the dipping sauce, and set aside. 9. Cook the fish. Grease the foil-lined baking sheet with a bit of olive oil, and then arrange the tilapia in a single layer. Rub each piece of fish with a bit more oil, and then season with salt and pepper. Pop in the pre-heated oven and bake 10-15 minutes, until the fish is opaque in the middle and flakes easily. 10. While the fish is cooking, cook the pancakes. Heat your most non-stick skillet over medium-high heat, and add about 2 T of vegetable oil. When the oil is hot, scoop three large spoonfuls of batter into the skillet, and use the back of your spoon to flatten them a bit. Cook about three minutes on each side, until both sides are nicely browned and crisp. Remove the pancakes to a paper towel-lined plate. Repeat with the rest of the batter in two more batches to get 9 total pancakes. The batter may separate a bit as it sits, so be sure to stir well before scooping each batch of pancakes. 11. Toss the chopped peanuts into the slaw. 12. 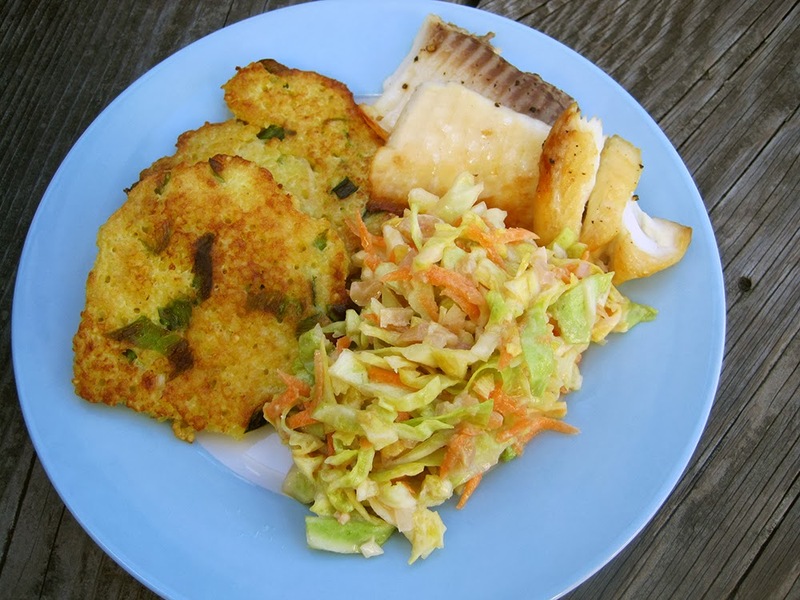 On each plate, place a couple of pancakes, a piece of fish, and a big scoop of slaw. Either drizzle the pancakes with the dipping sauce and/or use it for dipping the pancakes and fish.